I’m a big fan of MVVM, so I’ll use a ViewModel to access the Extents. I’ll also be using the DelegateCommand from Microsoft. 32:         // This extent should not be put onto the Extents stack. 39:         // This extent should not be put onto the Extents stack. UPDATE: See a new post to get the latest code for the custom MessageBox. UPDATE: After posting this blog I found out about the message box within the XNA framework. This does allow for custom button text which is what I was trying to accomplish. However, the user experience is different than what you get from the message boxes within the native phone applications (eg: deleting a text). With the native message boxes, the application bar disappears, but with the XNA message box, it gets greyed out. It’s the little things that matter. Also within the XNA framework you cannot add additional components to the message box. For example, you might want to add a “Do not show me this again” option within the message box. 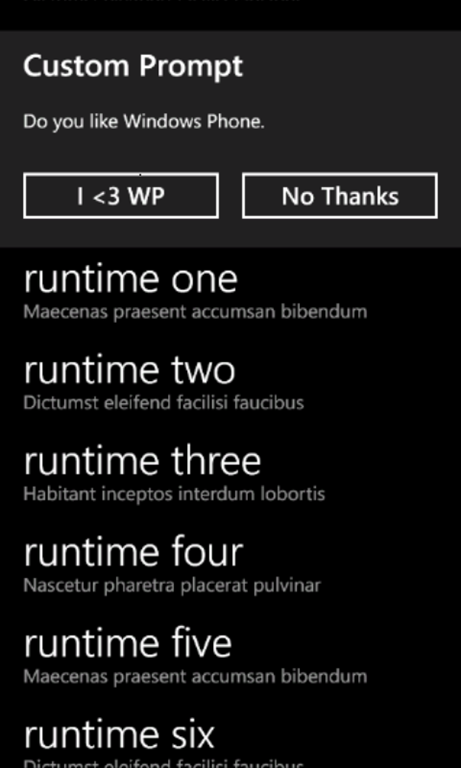 While using a Windows Phone you get prompted every once in awhile by a message box. Custom Applications have them, even apps native to the phone has them. When deleting a text message or a contact you get a nice prompt asking you if you want to delete it. But there is something unique about these message boxes that separates them from the one that you and I get to have. The standard message box only allows for an “OK” and a “Cancel” button. The message boxes that are native to the phone have custom text. When you delete a text, you are prompted with buttons “delete” and “cancel”. Seeing as there is not a way to do this, you need to create your own. I’ve created a very simple sample that can be used. The CustomMessageBox sample is based on the assumption that message boxes are “binary”. What I mean is that you get binary options, Yes/No, OK/Cancel, etc. So I’ve limited what is allowed to be a valid result. I don’t have the ability to have a Show method return the CustomMessageBoxResult so I’ll need an EventArg that will be used within an event. The xaml is pretty straight forward. We need to "”block” the page the CustomMessageBox is for. To do this I made the control a grid so it will fill up everything. Then give it a background with an opacity that will block all clicks. The message box has really one basic function, to ask the user a question. To accomplish that one function, we need to do three things. In case you were unable to see my lighting talk I gave at this years Esri Dev Meetup, here’s your chance! It’s hard to see the slides in the video of my presentation, so you’ll have to sync up the video with my slides. Devmeetup Colorado Shawn Kendrot from glenn letham on Vimeo. The talk was a lot of fun and I look forward to doing another. Maybe at the next Ignite Spatial? Pivot was originally released as a demonstration project that was a separate download from Silverlight itself. At version 5, Pivot becomes part of the Silverlight family. Pivot allows users the ability to visualize their data. Puts the power of filtering and grouping their data without the need to learn complex SQL statements. The original version of Pivot required you to have an XML representation of the data, and images that it would display. This required extra work for the developer, or web administrator to create this data from their data store. 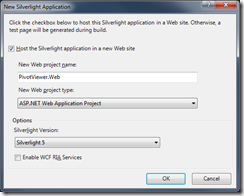 With Silverlight 5, you now have the ability to bind to any property that your class has. It also allows you the ability to create what’s known as trading cards with XAML. These cards replace the images you previously needed. You can even define at what stage you want a trading card to display. By defining different trading cards at different levels, you can give the user more information the more they filter down their data. When I first started looking into whether I’d be able to get PivotViewer results from ArcGIS Server, I figured I would have to create a Silverlight class with properties for all of the fields that I wanted to use within Pivot. It turns out that Pivot works great with the data you get straight from the ArcGIS or ArcFM Silverlight SDK. It easily binds to the Attributes Dictionary that is on the Graphics objects. You’ll need to add a reference to ESRI.ArcGIS.Client and System.Windows.Controls.Pivot. 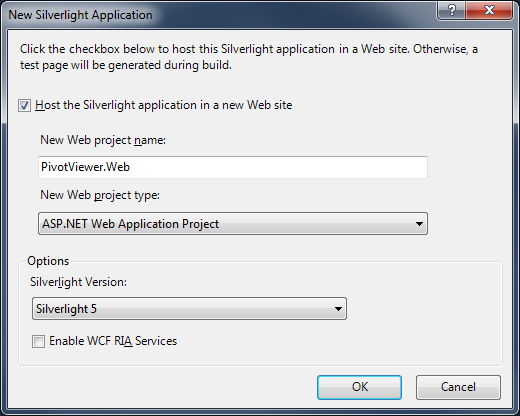 To add the ArcGIS Silverlight SDK, open the Add Reference dialog, and click the Browse tab. Browse to the location of ESRI.ArcGIS.Client assembly. The default location is C:\Program Files (x86)\ESRI SDKs\Silverlight. // Return all of the fields, we want use them all, but good to have 'em anyways! Add a call to this method within the constructor of the MainPage. When the task completes, all we need to do is set the DataContext to the Features that are returned. The XAML is where all of the magic happens. We are able to pick which fields the user will be able to filter/sort by, and define the trading cards. I want to give the user the ability to sort and filter switches by Installation Date, the Phase Designation, which Feeder it belongs to, and the Operating Voltage. So the fields I need from the Attributes dictionary are INSTALLATIONDATE, PHASEDESIGNATION, FEEDERID, and OPERATINGVOLTAGE. To do this, you add PivotViewerProperties. <sdk:PivotViewerDateTimeProperty Id="InstallDate" Options="CanFilter" DisplayName="Date Installed"
<sdk:PivotViewerStringProperty Id="OpVoltage" Options="CanFilter" DisplayName="Operating Voltage"
I’m using fields that have domain values, so I need a few value converters, I won’t bore you with the conversion of the domains here. If you need to sort/filter by date values, like the Installation Date, use a PivotViewerDateTimeProperty This gives you cool date filtering capabilities. I don’t have any integer values that I’m sorting by, but if I did I would use the PivotViewerNumericProperty. To create a trading card, add a PivotViewerItemTemplate to the ItemTemplates collection. This gives our trading card a Metro feel. But there isn’t much data here, as the user drills further into their data, I want to show them more. We can add more trading cards if we want to add more detail when users start filtering their data, or using the zoom capability of Pivot. To do this you set the MaxWidth property of the PivotViewerItemTemplate, and add another template. To see more, download the complete sample here. Give your users the power to SEE their data.